Obtain Telangana ePASS Status here on our site. TS ePASS Status checking process also provided. So, verify ePASS Status TS 2017 – 18. On this page, we are provided the steps to check Telangana Epass Scholarship Application Status 2018 – 19. Hence, it will be easy for the students to check the status online. Go through the process of TS epass Application Status here and check on the official website @ telanganaepass.cgg.gov.in. The TS Government has issued the online Scholarship application facility for Post-metric & Pre-Metric students. So, the candidates can apply for the epass scholarships 2018-2019 in online. The students can apply for the Fee Reimbursement. This Step by Step ePASS TS Status Online Checking Procedure is not only for new Applicants but also useful for the applied Students. Students who belong to OBC/BC/SC/ST/EBC category can apply for the scholarships. We have also provided the Telangana ePASS Registration Procedure for the New Applicants. 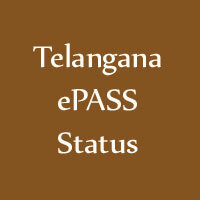 Therefore, The students can Check the Complete Details of Telangana ePASS here on our Site. On our site, we have provided the Stepwise Procedure to access the required information easily. So, the Applicants can follow our site and Know the Process. Before finding the application status, the candidate must be ready with the necessary details which are required at the time of verification. The details required to be filled are given below. Therefore, we advise the students to have a glance. The above-mentioned details are for the Post-Matric applications only. While the Pre-Matric application status can be known by entering the Date of Birth and Application ID. Individuals who want to Check their Telangana ePASS Status can follow these simple steps. First of all, visit the official website of Telangana ePASS. The Home Page appears as follows. Now, Drag the Scroll Bar to the bottom. There you can find the option ‘Scholarship Status’ as shown below. Click on ‘Scholarship Status’, it will redirect to a new page as shown below. Now, before entering your details, select the course from the ‘Status For’ drop box. Enter your Application No & Academic year. Fill your SCC Exam Number, Pass Type and Year of Pass. Enter the Date of Birth in DATE-MONTH-YEAR Format. Click on ‘Get Status’ button. Finally, the Status of your application is displayed on the screen. The candidate who belongs to SC/ST should have their annual income less than 2 lakhs. For the BC students, the annual income should be less than or equal to one lakh to attain the Eligibility for TS ePASS 2018-2019. In most of the cases, the applicants can easily verify their Telangana Status. But sometimes, the candidate cannot get their Telangana ePass Application Status. It may be due to the Rejection of Application. Therefore, the students must be careful at the time of filling the details. The Telangana Fee Reimbursement Rejection Reasons are given below. If the applicant is not the bonafide student the application will be rejected. Non submission of caste, Income certificates . Claiming scholarship for same level courses. Previous sanction verification for renewal. The Students admitted under management quota. Non-receiving of the renewal proposal. Non-submission of hard copy of the Telangana ePASS application. Discontinued/Detained students in case of renewals. Hence, the individuals should be cautious while filling the application form. So, follow the Telangana ePASS Status Verification Procedure and Check your Status.